I've always wanted to post this recipe because each time I eat this, I'm thinking of all those single or away-from-home students who'll appreciate this because it's so quick to cook yet absolutely delicious. If you are tired of instant noodles and don't have time to soak your mi fen or rush out to buy fresh egg noodles, this is it. All you need is an egg, plain flour and water and you'll make slippery-smooth, soft yet el dente noodles in less than 5 minutes! No kneading or rolling, no pre-cooking of the noodles and most of all, no additives or preservatives (other than what's already in the flour). Slice some meat and veg and you can prepare a very tasty bowl of wholesome, home-made noodles. Serve it with a chili-lime-Maggi soy sauce dip, or Sichuan hot chili and peppercorn oil, and it's comfort food, especially on chilly days. This is what my Shanghainese MIL cooks now and then for lunch, and we love it. Sometimes she cooks it with pork slices and Taiwan bok choy and sometimes minced pork and xue cai, a preserved veg. Today I used seafood (squid, fish and prawns), pork liver and watercress. Basically whatever I have in the fridge so I don't need to run out into the hot sun. I love knowing that every morning for the rest of my life when I wake up, it's not going to be -20 C and snowing, but it's been scorching hot these couple of weeks and I miss dark, gloomy, rainy days when I can sit out and sip my coffee. It does take a bit of practice to get evenly-thick strands of noodles and I got my MIL to demonstrate making men tiao for us today. I wonder how many of you out there has eaten this noodle before? If not, try it, you'll thank me I'm sure! 1. Mix everything together in a bowl until batter is very smooth. 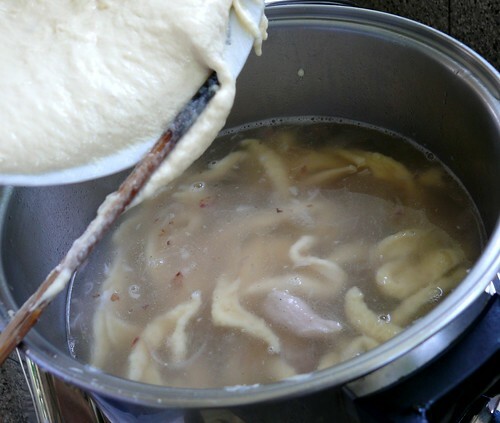 It should be very thick.If too thin, the noodles will be too soft and the soup will be cloudy instead of clear. MIL said it's best if you leave it to rest at least 1 hr. I have had an experience where I used flour with higher gluten (like Blue Horse) and an hour later, the batter was too sticky to use. So, I usualy leave it for 15 min. before cooking but I have also used it straightaway without any adverse results. 2. Meanwhile, you can prepare your soup ingredients: any meat slices and veg. Season the meat with sesame oil, white pepper, salt and a little bit of cornflour. 3. Put 6-7 cups of chicken stock/water into a pot (you can fry some shallots in oil until soft and then add the water/stock, for extra flavor if like) and when it boils, add the pork if using that. If using seafood or beef or chicken, I like to put them at the end after all the noodles are in so that they don't toughen. 4. Now hold the bowl and tip it until the thick batter is at the rim of the bowl. Using one chopstick, 'cut' the batter and let it drop into the stock. When batter has dropped off the chopstick, dip the chopstick into the water/stock to wet it so that the next noodle will drop off easier. 5. Repeat until all the batter is done, stirring the noodles now and then so they don't stick together. 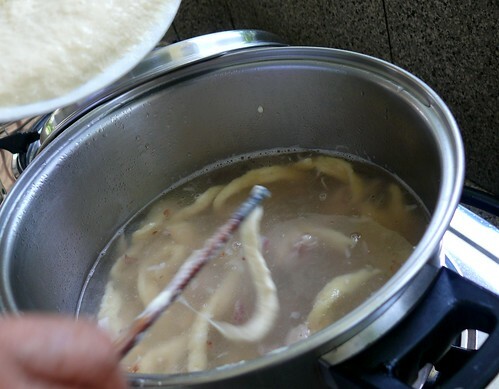 You must have your soup at a full boil (mine wasn't because I cooked it in my outdoor kitchen and it was rather breezy today) and work quickly so that the noodles cook at the same time. Do not cook more than this amount of batter each time or you'll take too long and the soup will be cloudy. 6. Add the seafood/chicken/beef, let it boil and add the veg and switch fire off. Season to taste with salt. This is very delicious! I had tried this before when I was in Shanghai and other part of China. Waiting enthusiastically for your posting from Netherlands, one of my favorite places! 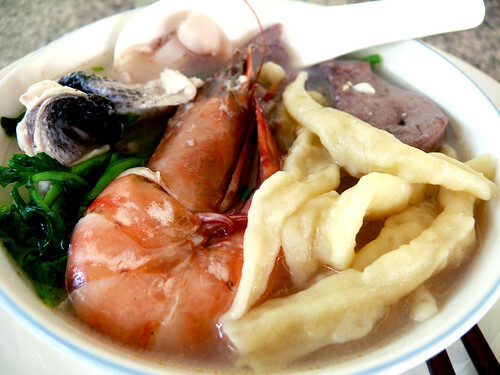 this look totally cool, delicious, does it taste like pan mee in malaysia? i hope you have arrived safely and are enjoying your holiday. don't forget to take too many pictures while you are out roaming the continent.